First Line: I was in the middle of laying out the ingredients for my carrot muffins when the call came. When dessert chef Casey Feldstein discovers that her recently deceased aunt still has a scheduled yarn retreat, she reluctantly agrees to host the event-- even though she doesn't know a knitting needle from a crochet hook. The idyllic setting on California's beautiful Monterey Peninsula turns deadly when one of the retreat regulars is found murdered in her room. Feeling somewhat responsible for the woman's death, Casey begins making observations, asking questions... and before long she sees a pattern beginning to form that may even shed death on her own aunt's death. She can't stop now. Casey also happens to be surrounded by an interesting group of secondary characters. Her best friend Lucinda runs a popular local restaurant along with her OCD husband, Tag (whom I see as a potential rich vein of plot twists). Hotel manager Kevin St. John is a perfect thorn in Casey's side, and those attending the retreat are certainly a good blend of differing personalities. The hook-- knitting retreats-- is more than a hook and plays an important role in the book. In fact-- with my own rekindled interest in knitting-- it sometimes overshadowed a very good mystery. With Casey being a complete novice, author Betty Hechtman was able to "show us some of the ropes," as well as really showcase what a yarn retreat is all about. I found myself paying just as much attention to what handmade items the retreat members were wearing, how each of their local groups operated, and how Casey's aunt was a genius in choosing individualized projects as I did to clues so I could identify the killer. 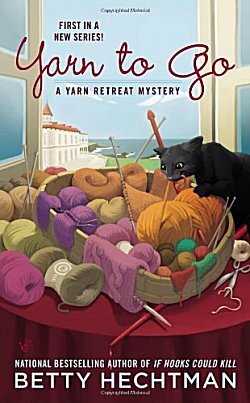 With the beautiful setting, a fine cast of characters, and a good blend of knit, purl, and murder, I definitely look forward to reading more books in this series! What a lovely setting for a novel, Cathy! And I do like the blend of different characters. Sometimes I think authors go a bit far to make sure their characters are 'quirky' enough. Make sense? Anyway, this seems like a solid series.